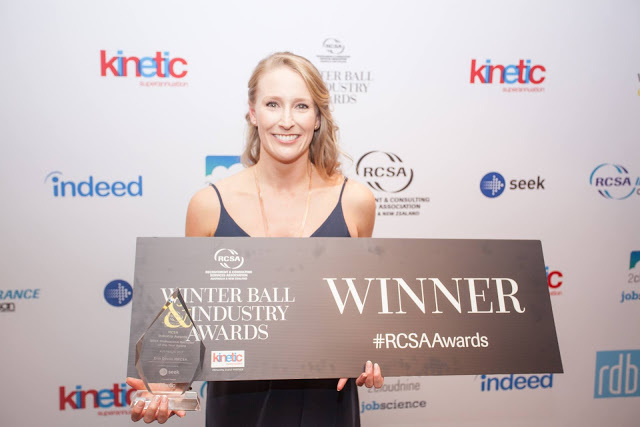 At the recent RCSA Winter Ball we had the unprecedented situation of three finalists for the 2017 RCSA Professional Recruiter of the Year being employed at one company. I am fortunate to to know the individual merits of each of those finalists (Catherine Kennedy, Sam Palmer and Erin Devlin) and would not have wanted to select a winner, let alone the competition from the other three finalists who I don’t personally know (Emily Martyn, Stephen Veness and Michael Taplin). Erin took home the prize on the big night and, after a recent family holiday on the other side of the world, kindly spared me some time to answer my questions about her win, her career and her advice on succeeding as a recruiter. Ross: Congratulations on your win, Erin. I want to start by discussing your background. Your path to becoming a recruiter was far from the norm in this industry – your first job was with The Australian Ballet. How did you progress from being a ballet dancer to choosing recruitment as a career? Erin: Thanks, Ross. Amazingly, much of the same discipline applies in recruitment as in ballet. In both jobs you have to be very focused, self-motivated, resilient, and achievement and team oriented. When I finished dancing in 2004 I travelled around the world working with Emirates Airlines. Settling back in Melbourne in 2007, I registered with Drake International as a temp. Instead I was offered a permanent job in their training department, where I observed the recruiters from afar, and shortly after approached the manager for a recruitment job. I chose recruitment because for me it is the perfect balance between achievement, learning, teamwork, and rewards. I like learning about, and working with, growing businesses, working with high performing people, and being part of the growth of my clients’ businesses and candidates’ careers. I like that the harder you work in recruitment, the more you are rewarded, and it’s not discretionary. You work hard, you get rewarded – both financially and in outcomes. Now for me it’s about seeing the growth of my team, including their individual careers, and the business overall. Rejection: Even ballet doesn’t prepare you for the ‘nos’ you’re going to get in recruitment, but you very quickly learn to build your resilience, take nothing personally and move on. For me this was after the first few placements. In how many other careers can you be rewarded for the hard work you put in in the same way that recruitment can reward you? You are in total control of your own success. You started your own recruitment agency after less than three years as a recruiter. What motivated your decision to become an owner? I’ve always had ambitions to run my own business. Even though I was only 24 at the time, I took on a franchise type arrangement with much higher risk, but much higher reward, and it paid off. This worked very well, but over time, ultimately it made financial sense to grow the business under my own brand into the future. I also wanted to deliver the highest possible level of service to clients and candidates, without restriction, and within an innovative environment. Now, still remaining an owner at people2people, but within a larger business framework, this has been the best recipe for success. I attribute this to the innovation, culture and leadership within the business. What types of roles did you recruit when you were at Drake and what sort of roles do you recruit now that you are Managing Director, Victoria of people2people? At Drake I focused on sales and marketing positions. 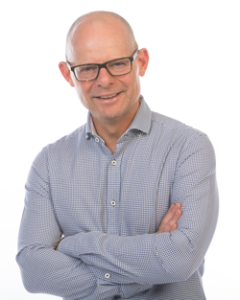 As MD, VIC at people2people, I now focus on senior positions, account management, as well as rainmaking and business development for the team. I also often grow a desk to hand over to a new starter, so that they have a head start. Training has been integral to the people2people culture. I run many training sessions internally, and learn from my peers. At a personal level I learn a lot from my mentors, and continue to develop myself through resources such as Recruitment Juice, your leadership courses Ross, and undertaking RCSA courses. I have involved myself in volunteering with some of the RCSA’s committees, which also develops my professional knowledge further. I am also a mentor in the RCSA PEARL program. I also read a lot of books and industry publications. When you were a full time recruiter growing your desk how did you use statistics or KPIs to manage your performance? If so which ones and how do you use them? Greg Savage has been an enormous influence on my recruitment career. Over the past two and a half years he has helped me to evolve my leadership style, which has led to excellent financial and organisational results. He has challenged me, pushed me and inspired me, and assisted with some of the tougher challenges as the business has grown bigger each year. Mark Smith has been an inspiration since we met back in 2014. He is an innovator and a market leader. People work for Mark because he is authentic, positive, innovative, does what he says he’ll do, and is always creating an environment at people2people where recruiters can be successful. Along the way I have been lucky enough to be mentored by other industry leaders and developed relationships with RCSA councillors including recruitment leaders from Manpower, Aspect, Bayside, Smaart, Chandler Macleod, and other major agencies. Also the wider people2people team have had a big influence on my style and I have learnt a lot from being immersed in the company environment. What do you attribute your win in RCSA 2017Professional Recruiter of the Year (2017) to? I’m humbled to have been given this award. I think ultimately the award is about recognising those that have not only achieved financial success and rewards, but have also contributed to the industry for the better, and shown leadership and innovation. Financial success alone is not enough. I believe that you can achieve great financial success, whilst also being a positive influence on the industry and those around you. Innovate and don’t stop. Embrace the trends that are emerging now. Don’t be the last to get on board. Those methods that you have used for years may still be relevant, but could you be doing something faster, smarter, more effectively through technology, amplification or targeting? Partnership and looking after stakeholders will never lose relevance either. If you remember that we are working with people every day, then you can continue to achieve great outcomes. Also, find ways to add value to clients outside of the traditional recruitment process. Value yourself and your service. And, get off the email and pick up the phone! Energy, positivity and innovation; every day. Pareto’s 80/20 rule and ‘Done is better than perfect’, or ‘Just do it’. That is get moving! Get up and work hard every day. Always find ways to work smarter too. Look after yourself, your staff, and your customers, and this will lead to great outcomes. Celebrate the wins, focus on the positives and develop people’s strengths. Lead, inspire, and be accountable every day. A career in recruitment is not easy, but incredibly rewarding. If you can focus, be clear on your goals, and put in the hard work, then you will not only work with some of the most fantastic individuals in business anywhere, but you will be financially, personally and professionally rewarded. Go for it. Thanks for your time, Erin, I greatly appreciate it. No problem, Ross, thanks for the opportunity.